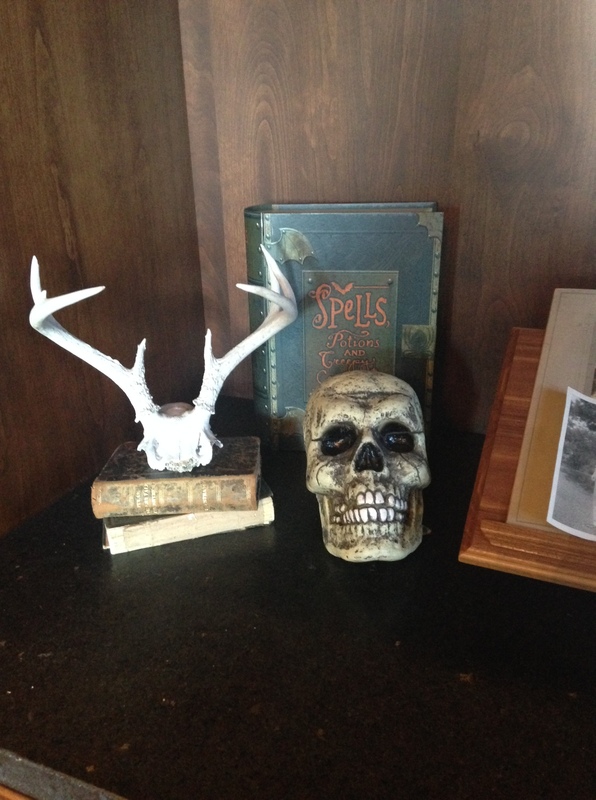 Showing you a bit more of our Halloween decorations today. Hope you enjoy! Hey, there. 🙂 It’s a rainy morning here in Arizona and I am in full-on Fall mode with my clothes — tights, a long-sleeved dress, and I am planning on putting some boots on later when I leave the house. 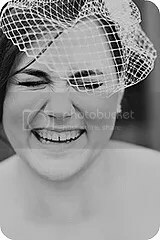 This girl is a happy one! Blue and white interiors…I love them. 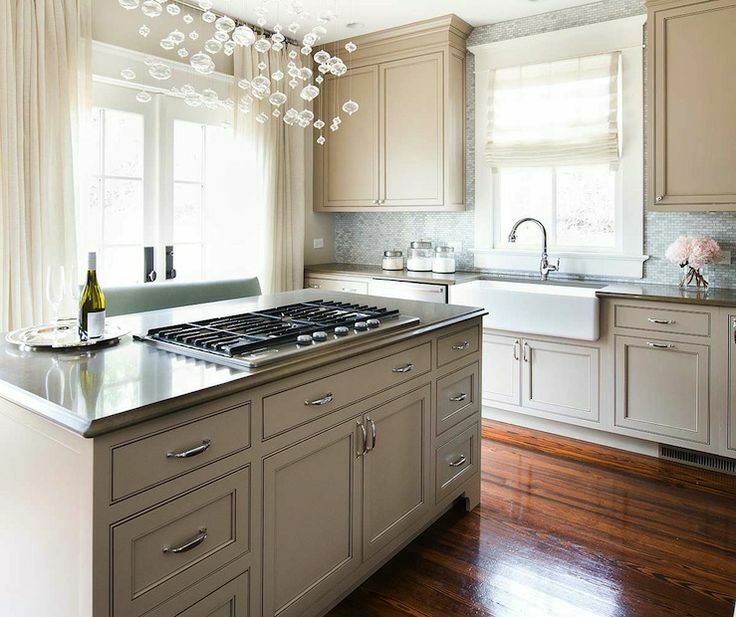 Whether classic or contemporary, this color scheme never has and never will go out of style. This is the perfect marriage of traditional and ultra-modern. Lindsey Adelman and her light fixtures leave me speechless. I have loved this bedroom for a really long time — I always come back to it. 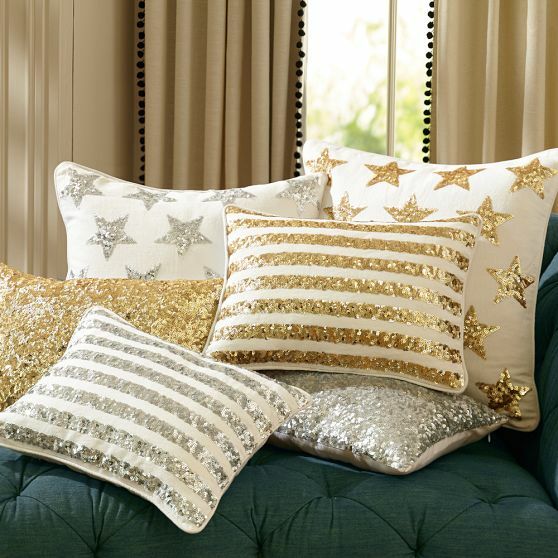 The fabrics look so luxurious, I think that’s what draws me to it. 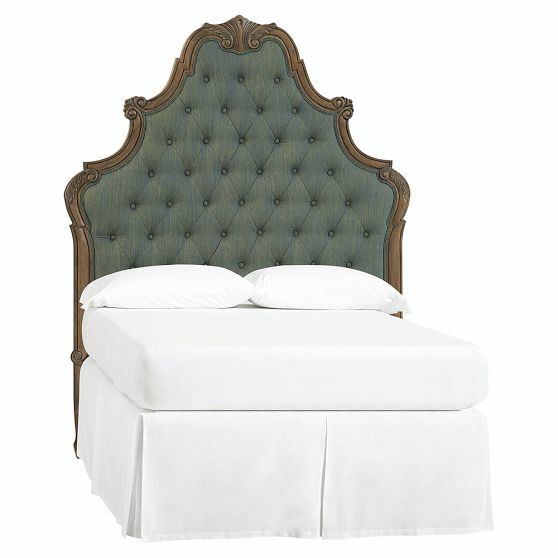 Plus the French furniture. 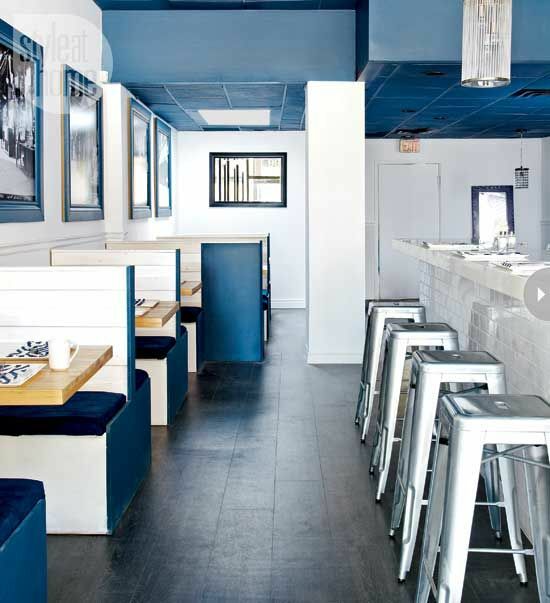 How fun is this blue and white restaurant? The metallic Tolix stools add a nice pop that keep the space interesting and current. Expertly done, this room. There are so many different styles and time periods mixed in here, but somehow, it works. Don’t even get me started on that wallpaper. Toile is my favorite. 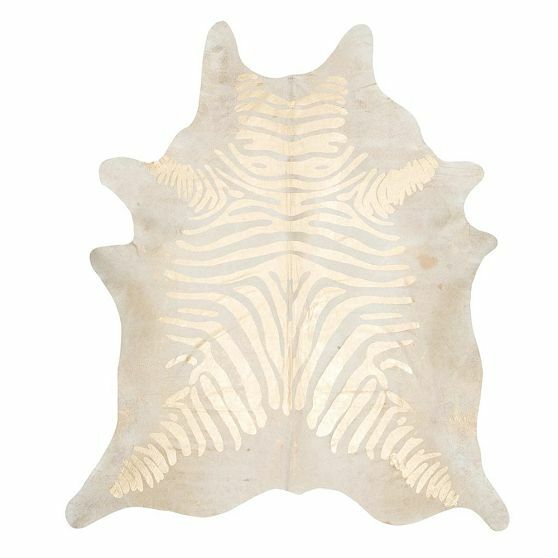 A black and white zebra-print rug grounds the room because of all of the colors workin’ in here. And the unexpected pop of green and yellow (chosen in the same chroma as the blue — perfect!) adds the best zing. A room like this is difficult to do, but it is really wonderful when everything works together, not against one another. 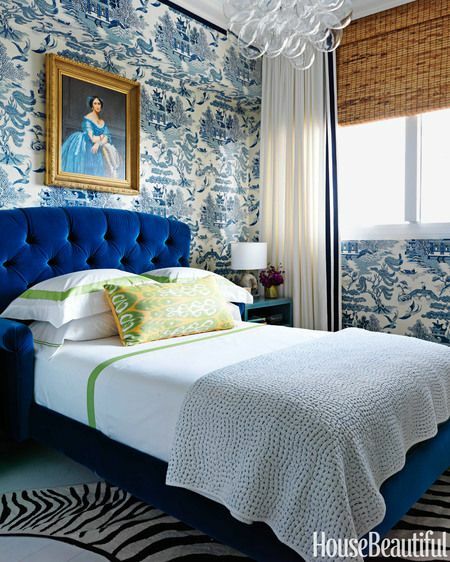 The statement of this room is obviously the wallpaper — and a beautiful statement it makes. 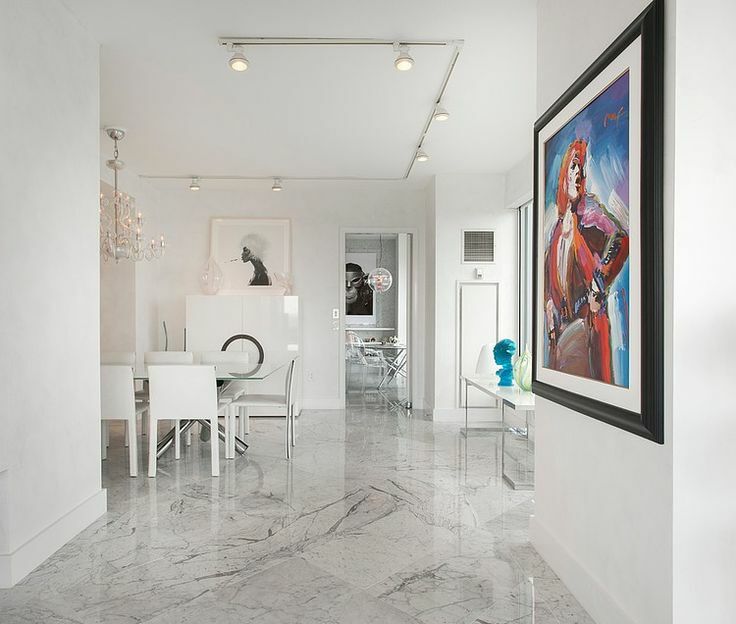 Keeping everything else white is great when you have a perfect focal point. There should be one star to the room — everything else needs supporting roles. The perfect blue was chosen, making this room pop. Stunning in every way. The distribution of blue, the birch wood art installation, the furniture silhouettes, and the lucite. Oh, and the color-coordinated child. Literally obsessed with this room. 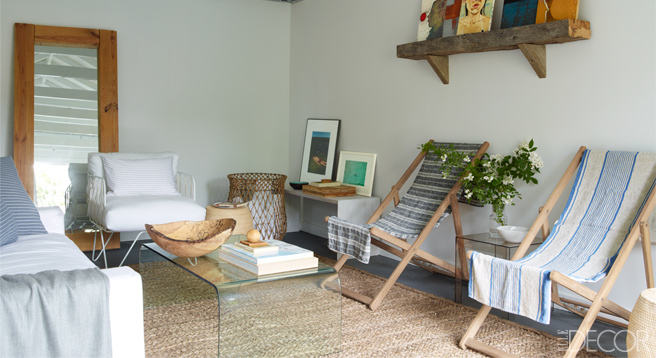 A few weeks ago I was looking through an old Elle Decor magazine and I stumbled upon a feature of the most beautiful and serene Hamptons cottage I’ve seen in a long time. It belongs to Malcolm Carfrae, the head of communications of Calvin Klein, and I just had to share it with you today. It’s super elegant and not at all fussy — my favorite combination. Let’s take a look inside! I’m in love with this paint color, first of all. 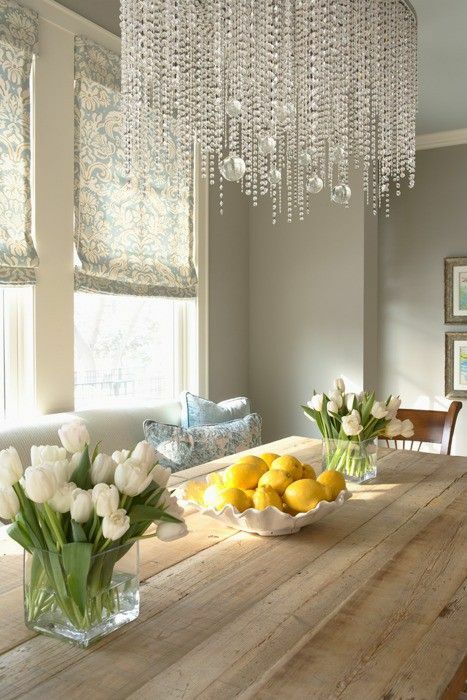 It’s blue-y gray and so reminiscent of the sea without being a typical blue beach house color. 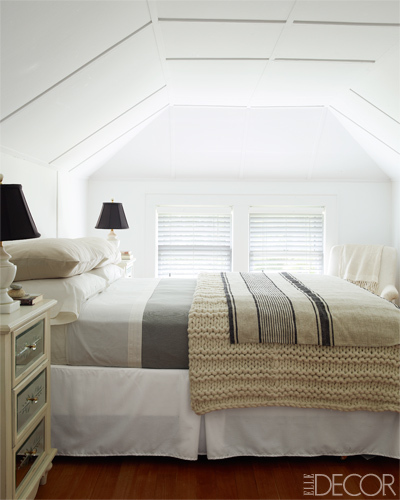 Really pretty neutrals in this guest room and plenty of texture. 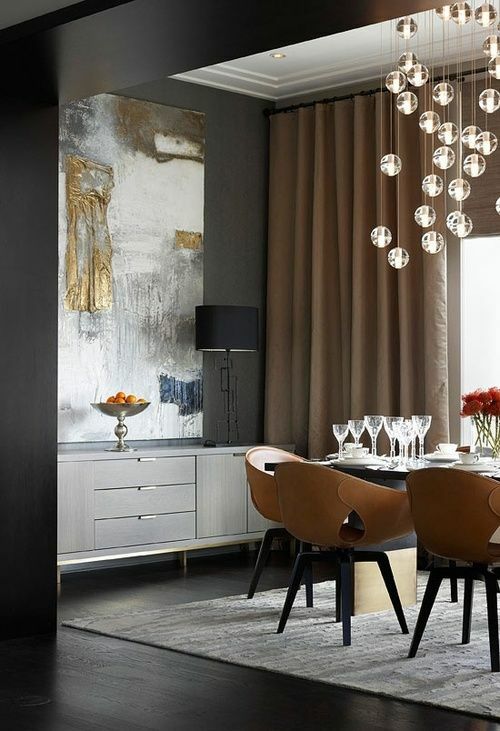 I also love the added drama with the white lamps and black lampshades. How cute is this kitchen? I love the mix of old and new, sleek and country-chic. Texture everywhere — the only way to properly do neutrals like this. Lots to appreciate in this room. Monochromatic and completely relaxed. I love the little zest of purple with the flowers — just enough to throw your eye around the space in a really interesting way. This is the pool house — and there is a little bit of a different vibe in here. Slightly rustic-contemporary-and-industrial. A bit of all of those elements becomes pleasingly eclectic and really comfortable and fun. What do you think of this house? Do you have a favorite room? 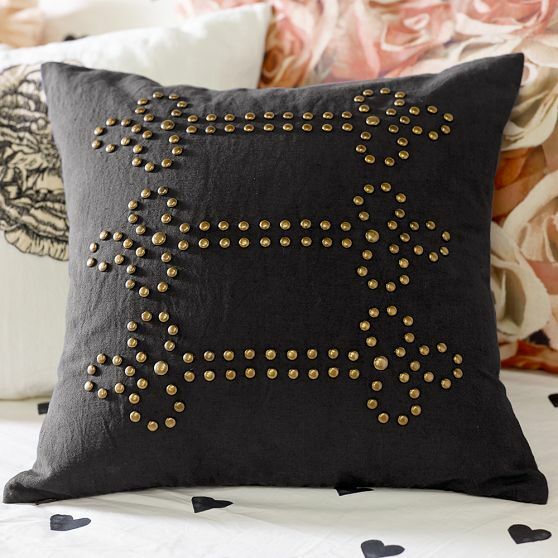 Last week I was at Pottery Barn Kids picking up a baby shower gift for a friend of mine, and I was completely struck by the amazing things that Pottery Barn Teen carries! Obviously the products at the Kids variety are adorable, too (the kitchen accessories are basically to-die-for), but there was a certain collection at PB Teen that I fell in love with. I grabbed a handful of the various catalogs as I walked out the door, and when I got home, I scoured the pages for the items I had seen. Really cute scalloped duvet set in classic black and white. I love the metallic stripes and dots on this duvet set. 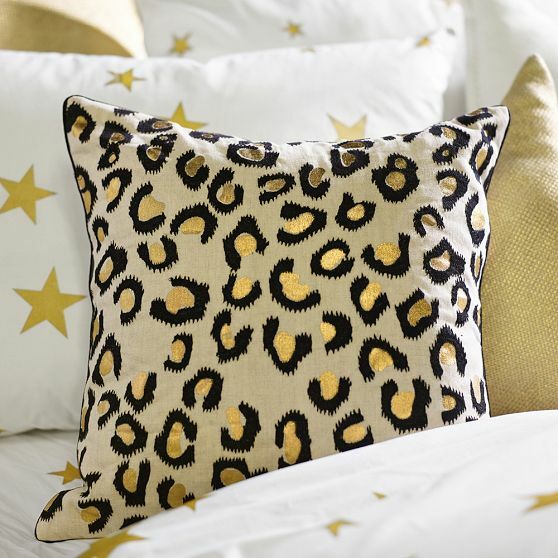 Of course, some leopard print is a must for any growing girl with style. 🙂 A little bit of glitz keeps the print age-appropriate. Some rivet designs — edging things up a little bit with some floral prints in the background. Love it! And you know that a teen girl needs some sequins in her life. It’s basically a necessity. 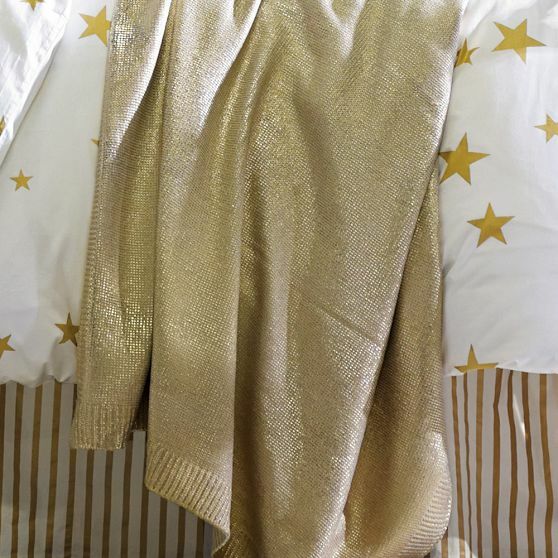 More gold — Pottery Barn calls this a Liquid Gold Throw. I love it! Adding a splash of Parisian elegance to the mix. 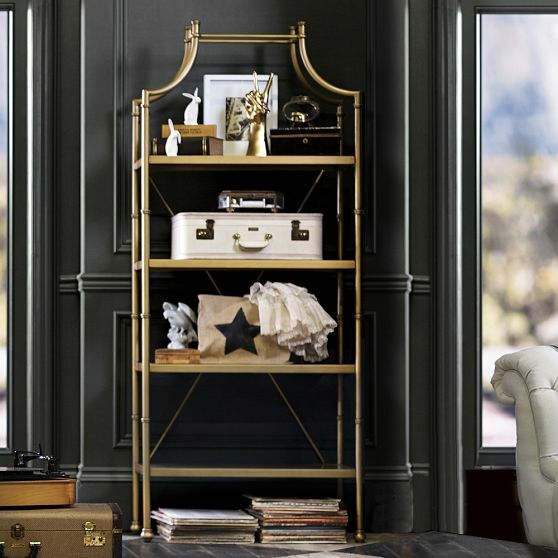 A really great gold bookcase — this is one of those Pottery Barn Teen items that I wouldn’t hesitate to use for an adult client (as long as the height was acceptable). 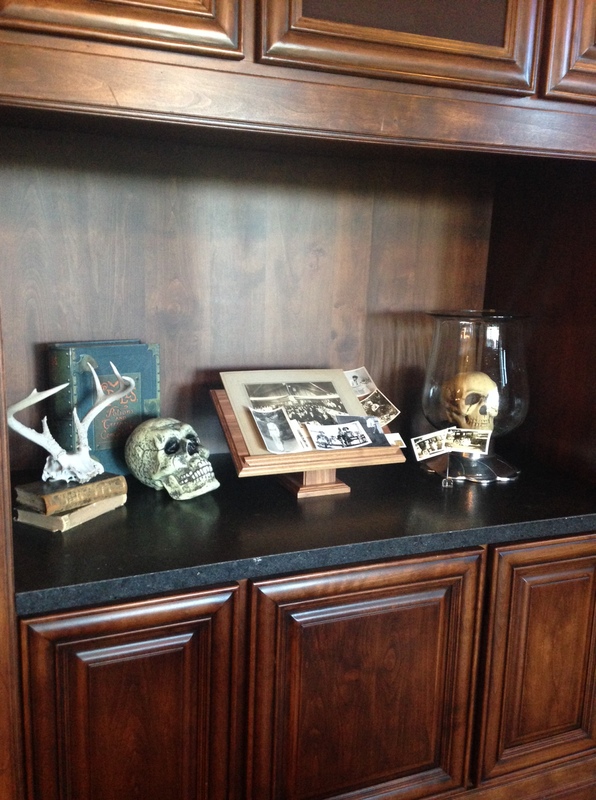 I would love a pair of these bookcases in an office! An adorable ticking stripe chaise. I really don’t think that anything else needs to be said about it. LOVE this pinboard. Another item that could be used in an adult’s space. 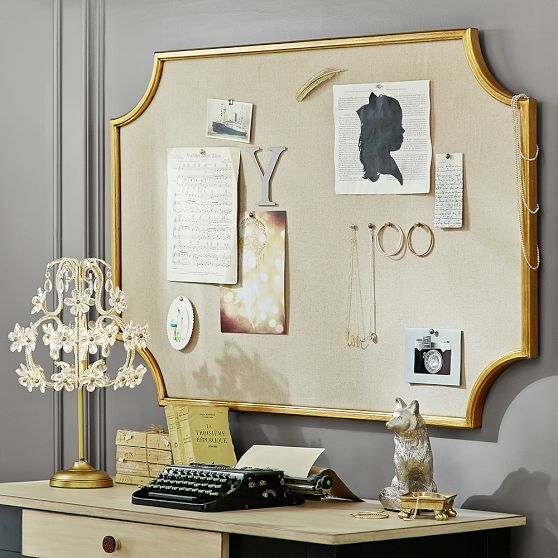 Again, love this for an office or closet to pin fashion inspiration, etc. 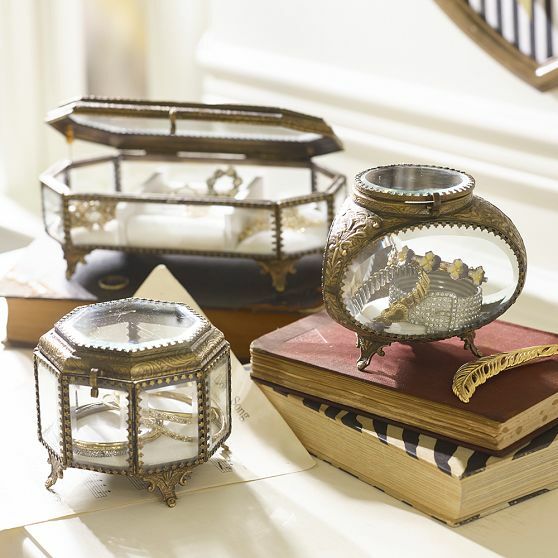 These are lovely and add a really pretty throwback vintage element to a room. Don’t they look like “grandmother’s”? 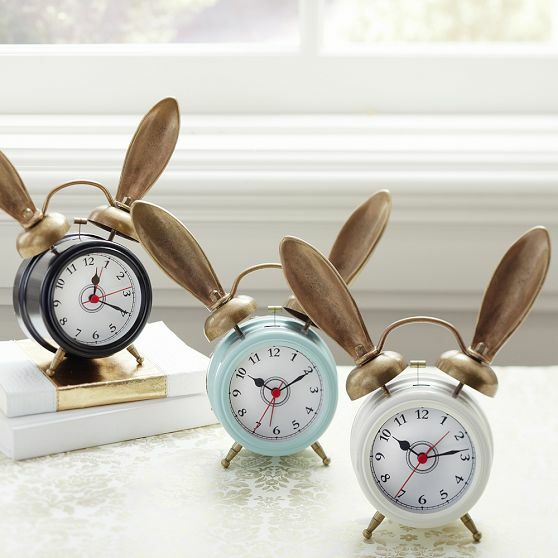 Whimsical and super sweet alarm clocks. A reference to Alice in Wonderland? And finally, perhaps my favorite item in the entire collection — this metallic hide rug. DYING, I love it so much. PS: This is not a sponsored post — I just fell in love with these things and I knew that you would, too! Here we have two colorful chinoiserie cabinets that are grounded by a statement piece — the black abstract art. 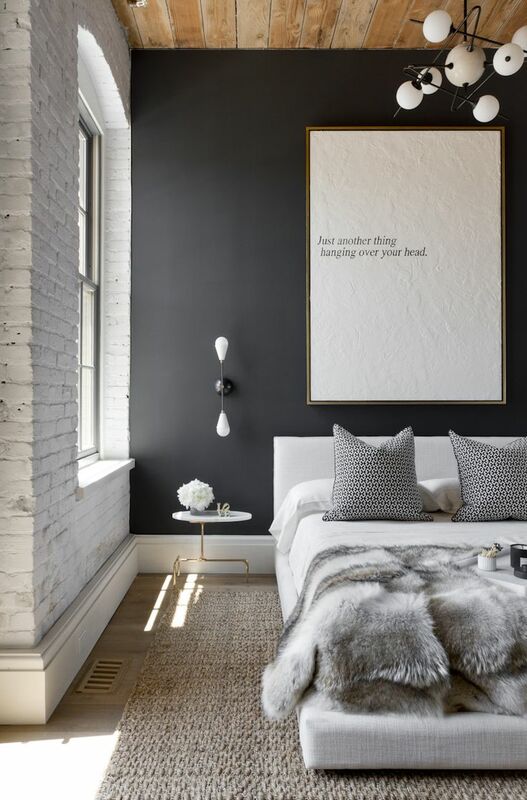 Black is great to use when you’re introducing bright colors to a space. Tones it down! How fun is this piece? The room without it would be way too mute and dull. But with the addition of this dotted canvas, it’s fun, lively, and contemporary. While I don’t find this interior to be incredibly inviting, just look at the amazing contrast here. The artwork makes it. 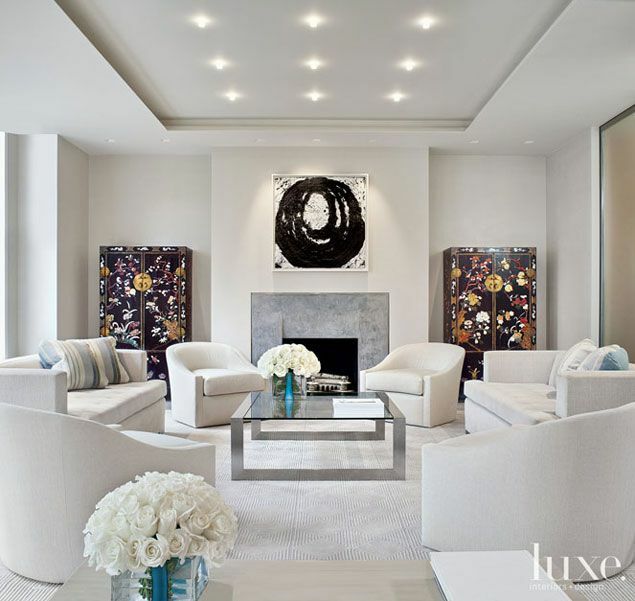 The color palette chosen for the piece really sets the mood for the space. Just think of how different the room would look with something brighter. Check out that ceiling! This definitely counts as artwork. 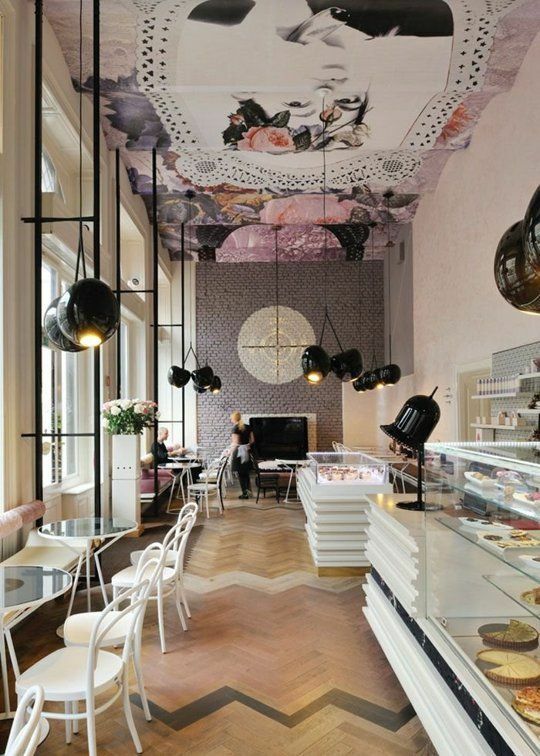 Speaking of which… I need to go to this cafe pronto. What some would consider a cold interior is warmed up in this entryway with a piece featuring reds, oranges, and bits of blue and purple. It absolutely draws you forward into the space. I would like to see more color in the other artwork, though! Perhaps there is more at some other angles that we can’t see here? 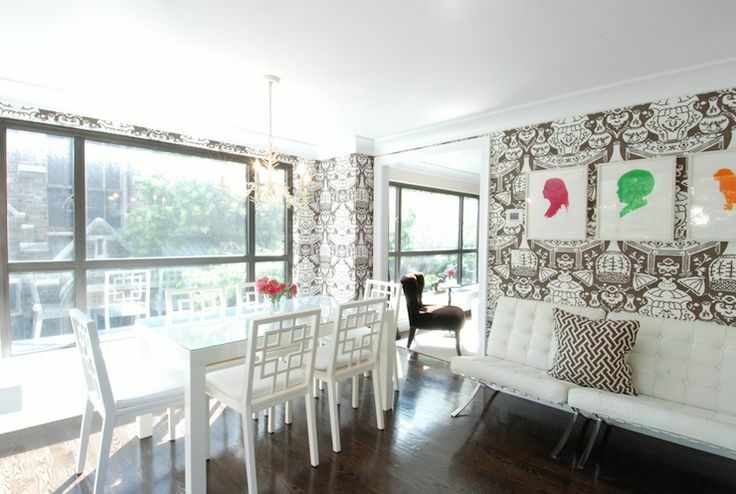 We’ve got statement wallpaper and statement artwork going on in this dining room, but it works! 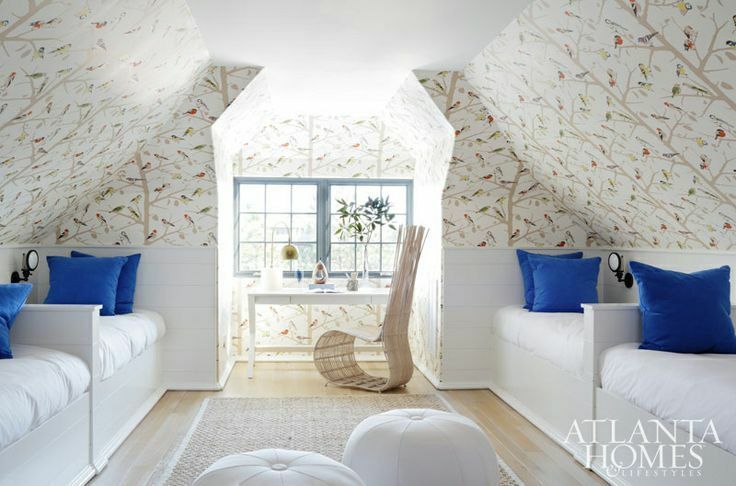 The wallpaper is busy and neutral while the art is colorful and simple. A great way to mix — it looks effortless and chic. Statement artwork doesn’t always have to be colorful, sometimes it can just make you laugh. 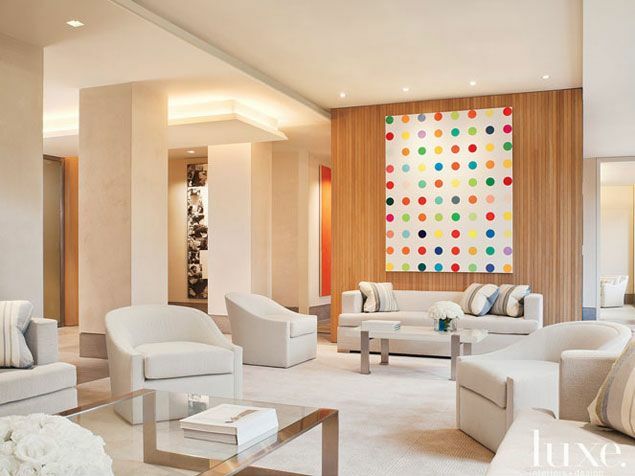 This piece works well with the monotonous color scheme, yet provides a bit of humor to the space. This is a piece of art that will be talked about — thus, making a statement. What kind of statement artwork do you like best? Colorful? Wordy? Black and white? Hey there, happy Wednesday! This week is flying by. I posted a couple of weeks ago Part One of my Pairing High and Low series. This is an easy topic and a fun one to master — pairing high and low furnishing to make everything appear to be luxurious and high-end. 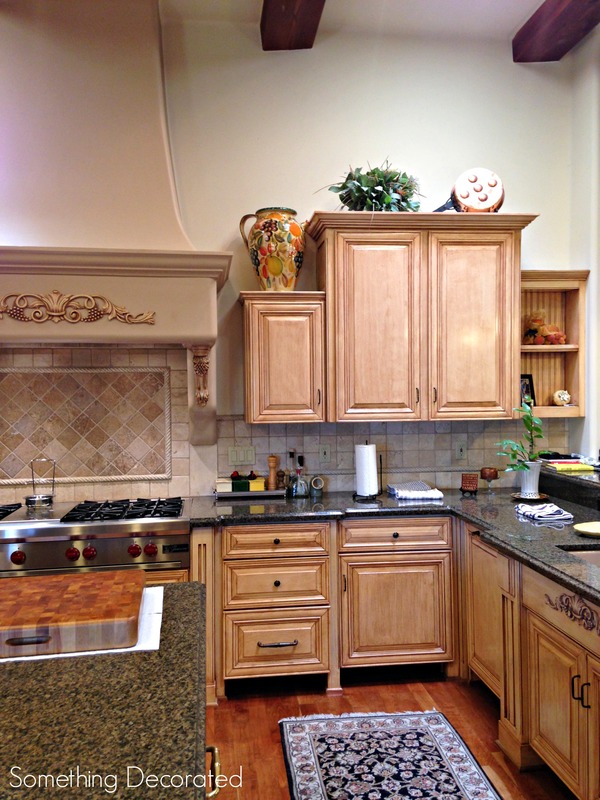 Today we’re going to look at my in-laws’ kitchen. As you know, most all of these posts (as well as any other home-related posts) will be of my in-laws’ house because we are living here. But their house doesn’t disappoint, so here we go! 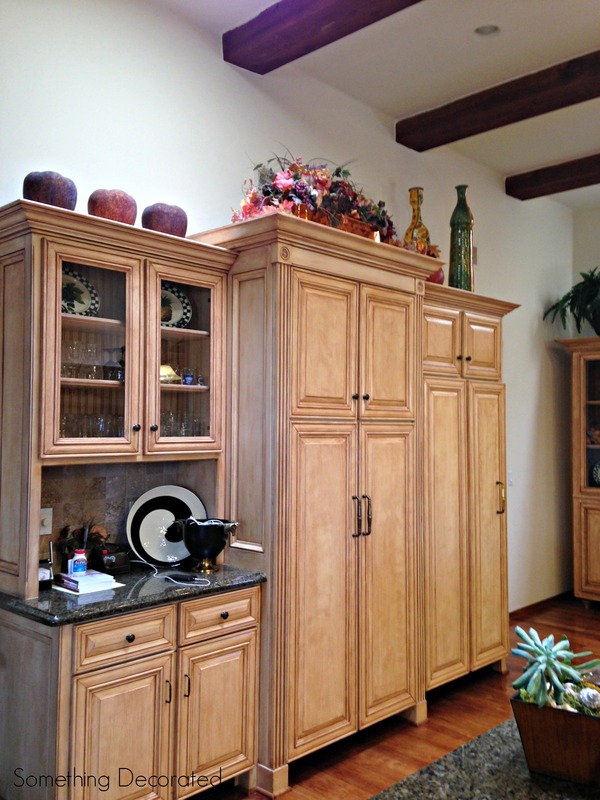 For this post, I’m really concentrating on the items displayed atop the cabinets. 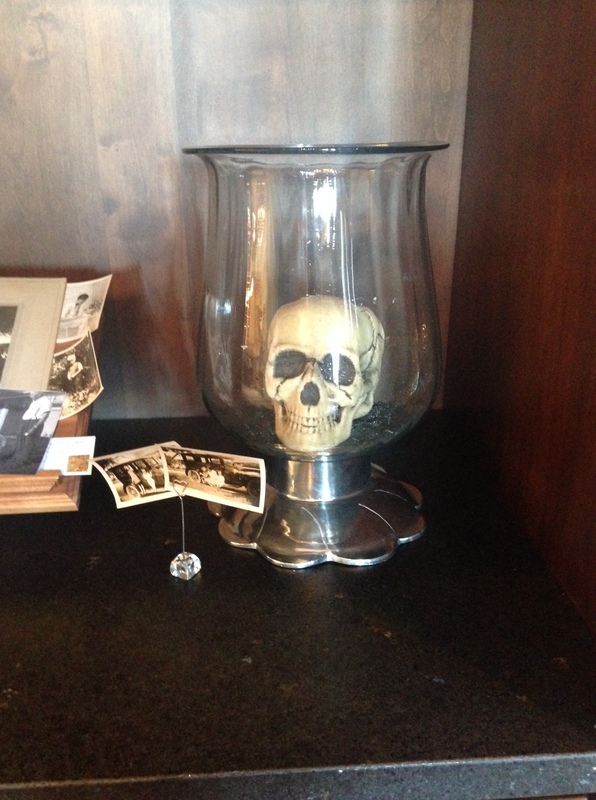 A few pieces are from a trip that they took to Italy, and then the rest is filled in with finds from HomeGoods. And there you have it! 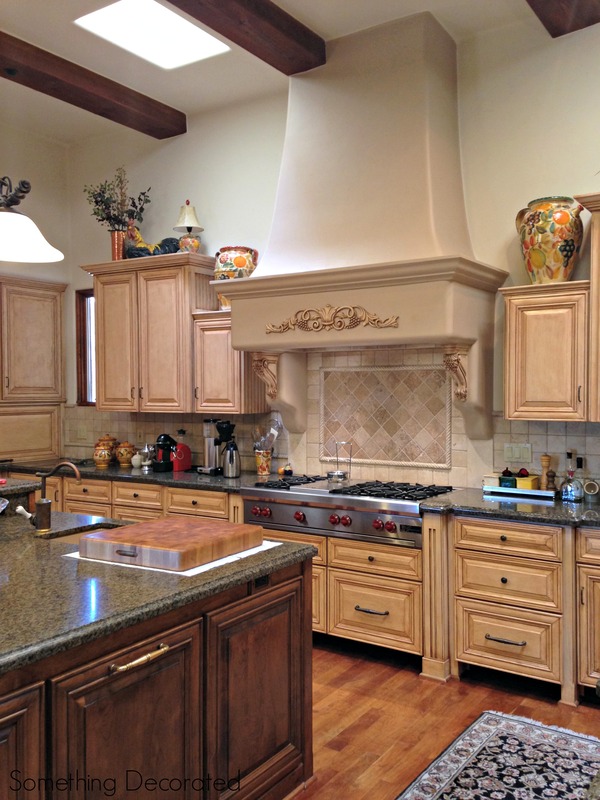 A Few High-End Pieces + Several Lower-End Pieces = An Overall High-End Look — for everything above those cabinets. Everything looks substantial and expensive. What do you think? Can you tell the difference? Hey there! It’s already Wednesday and I feel like this week is just flying by. 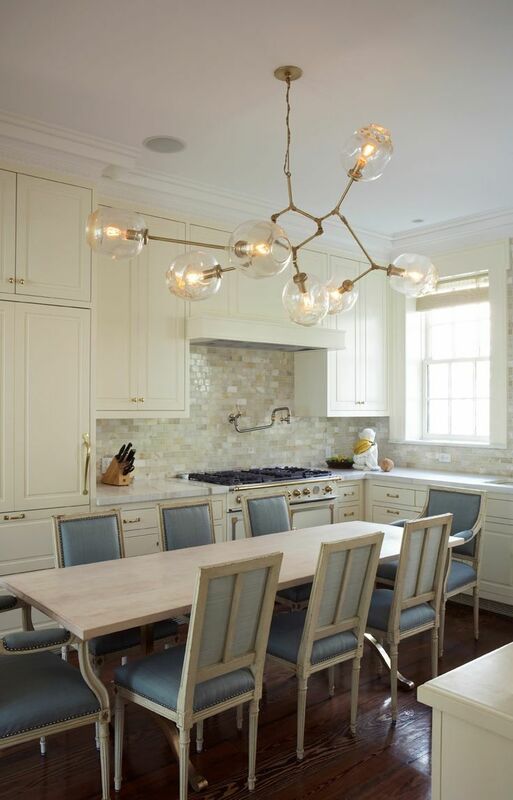 As a sort of continuation of my June post about those super-gorgeous Lindsey Adelman light fixtures, today I’m writing about the also-super-gorgeous bubble light fixtures that I am seeing so much of lately! You know, these? I love these fixtures. 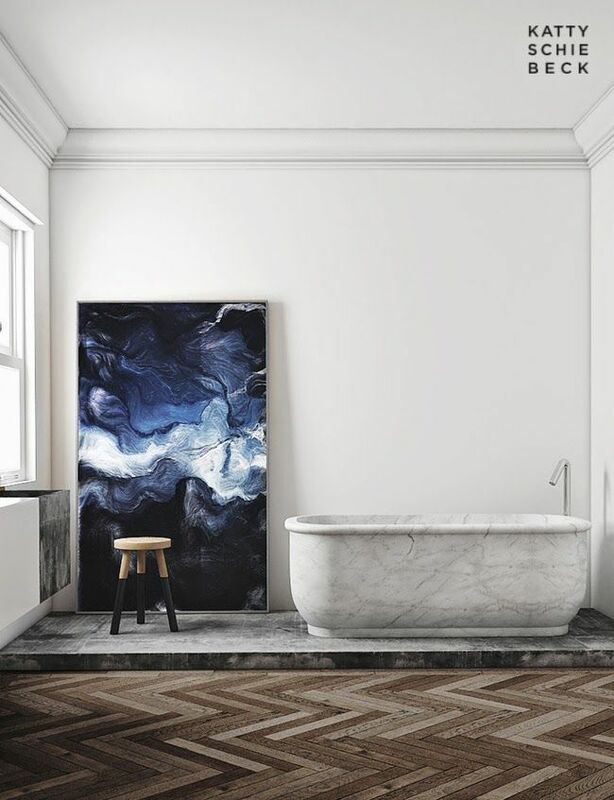 And yes, I am sort of biased because we are going to be installing one in a client’s loft pretty soon, and I just think they’re stunning… But there’s something so whimsical and delicate about them without it being a frilly or fussy addition to a room. Clearly gorgeous over a dining table. Have I made my point yet? Clearly the answer is no. Really pretty metallic bubbles in this bathroom. A masculine and feminine juxtaposition all at once. 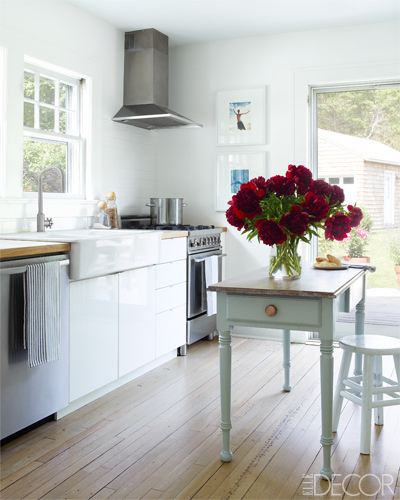 Equally lovely in this chic little kitchen! I love how simple this space is, but it is certainly not lacking in sophistication. How about this awesome egg yolk-yellow variation? To me, this screams, “Put me in an entryway with a high ceiling!” Would. Be. Killer. And, here it is, in all its glory…installed. And it does not disappoint. 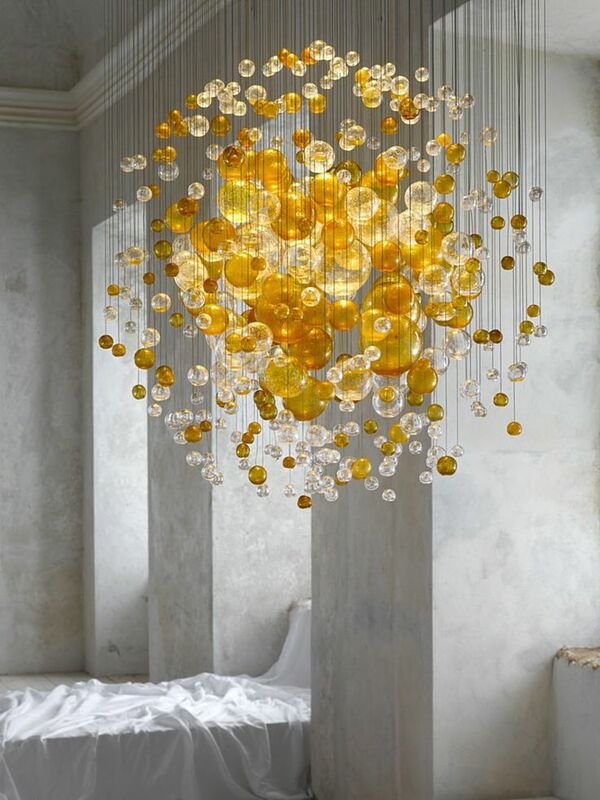 There’s also this fun variation — Sputnik light meets bubble light. I think it gives the look a little more edge, don’t you? 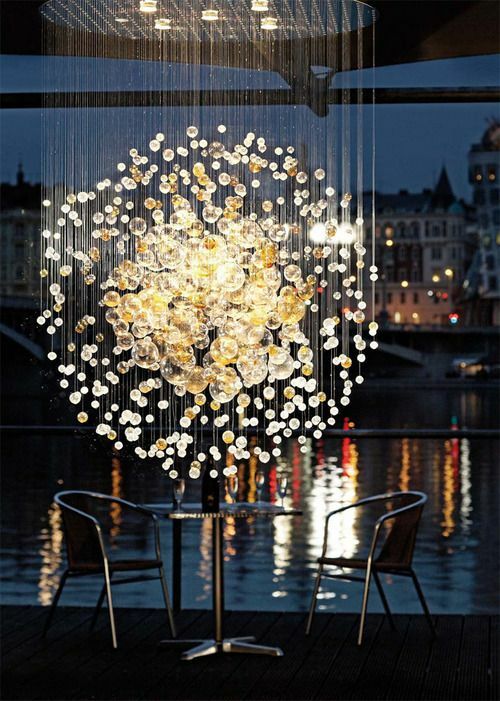 Lastly, I’ll leave you with my favorite variation of the bubble light fixture… If I were to put one in my home, this is the look that suits me. Super delicate, not too contemporary, and pairs really well with more traditional decor. Love it! How about you? 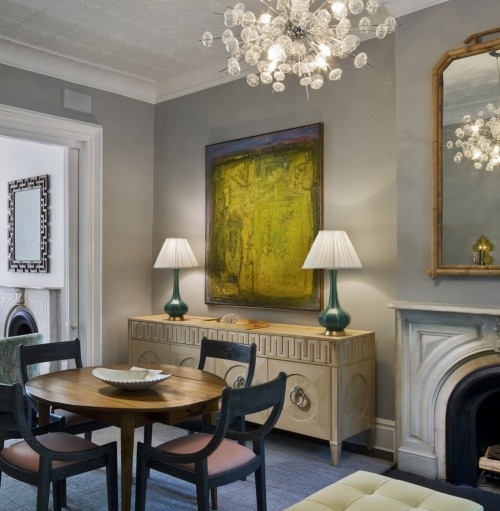 Do you LOVE the bubble light fixture as much as I do? Hey there, everyone. I hope you had a great weekend. Ours was spent with family, and we even got away on Saturday night to go out for dinner and eat the biggest ice cream sundae I have ever had in my life — it was awesome! I thought I would start a series that will only be a few posts, but I want to talk about the benefits of pairing both high-end and low-end furnishings; in other words, expensive things with inexpensive things. I have taken photographs of several areas of my in-laws’ home in order to show this to you all — they are really the masters of this topic. In their house, though a lot of their decor comes from places like HomeGoods, the fact that they have paired these items with high-quality furniture or accessories gives the appearances that everything is high-end. I’ll show you Part One’s example. All right. In this vignette, you have the fireplace, which is a fixture in the room and is obviously really beautiful. But on top of the mantel — two DIY centerpieces made from vases, feathers, and twigs (things that you can easily find at your nearest craft store); two prints in decorative, hefty frames; and one very expensive family heirloom clock. 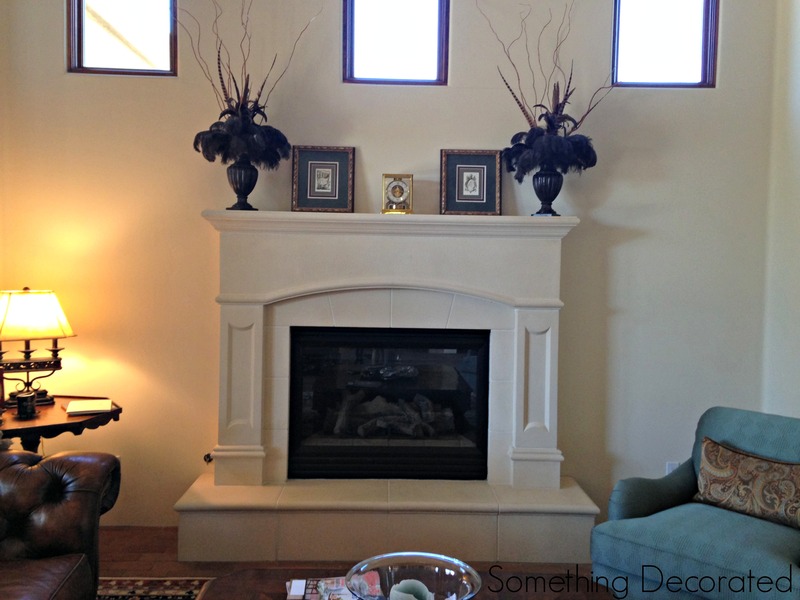 Without the clock, the mantel wouldn’t look as high-end. 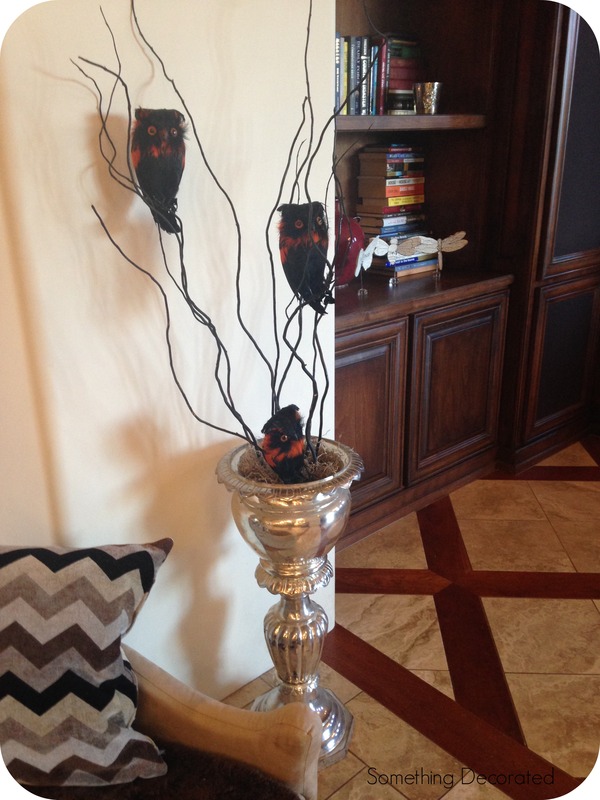 Those centerpieces look much more luxurious with the other pieces. Do you see how it all works together to create a balance of high and low, which all looks high-end when the parts are added up? We’ll be looking into this more as the next couple of weeks progress. Pairing high and low is such an easy way to add depth and chicness to your home while only investing in certain pieces. I hope you enjoy this series!